Cambs Police in their new sponsored kit. From the left are, back, James Bowen, Ross Spalthoff, Luke Upcott, James Malinowski, Dan Scott, Tom Gallagher, Paul Street,front, Craig Flavell, David Garwood, Craig Foster, Marcus Hering, Josh Williams and Steve Ashton. Cambs Police FC are back in action once again. 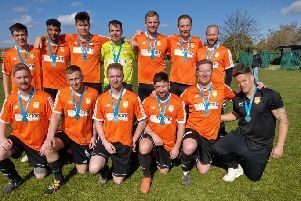 The team enjoyed plenty of success in the PSUK National Cup and the WPIST (World Police Indoor Soccer Tournament) after being reformed by Craig Flavell in 2011. But then in 2014 they became inactive again due to the lack of a manager. In autumn 2016, however, PC Josh Williams took over the reins and since then the team have been extremely active, competing in friendly matches against other police forces, Cambridgeshire Fire Service, Cambridge University and other local teams. And last week they played their first competitive game under Williams when tackling Thames Valley Police in the PSUK National Cup, a competition involving constabularies from all over the United Kingdom with the final being held at a Premier League ground. Unfortunately Cambs were pipped 1-0 and will be hoping for a more positive result in their next game away to Essex Police on December 19.